I think I hate drawing fight scenes. 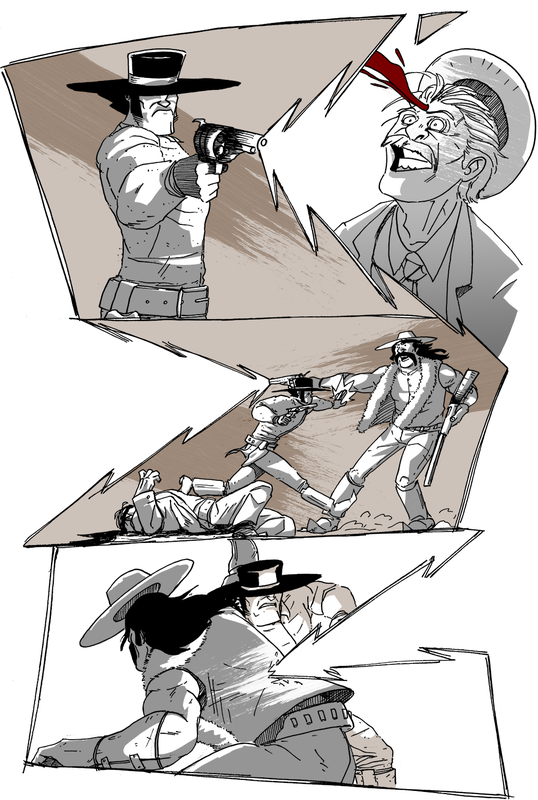 I definitely don’t like drawing gunfights or anything with severe violence. There were those kids that loved to draw bloody battles with body parts exploding off of the torso, accompanied by sanguineous spray, the ones that listened to loud heavy metal while doodling heads getting smashed to bits on the backs of menus and mailbox ads. Basically, the kids that scared me were the ones that drew that stuff. Gory violence never interested me as a subject matter and it still doesn’t. I don’t like drawing action scenes because, to do it well, it’s like choreographing a dance. 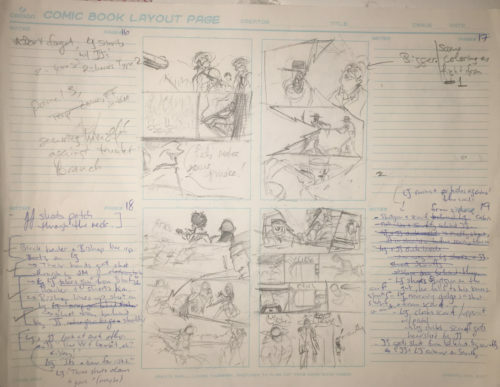 Like telling a story, it’s about making sure the action is elegant and expressive but also easy to follow. To that end, I played with both of those goals; the fight scene is messy and inelegant, and that’s on purpose. I want your eyes to keep moving back and forth across the page, assigning order out of the threads that you can find in order to make sense of it all, but once you have that clear narrative, it’ll be at the end of the sequence and and the violence is already done. That was my goal, at least. So, I had to figure out how to do that without drawing gory, disturbing, bloody messes. As chaotic as they may seem, this fight scene was thoroughly planned out. Aside from some bold choices in the first few pages of the first chapter, the panel layouts of Long John are rather straight-forward. Part of that’s on purpose––more than anything, I want the action to be clear and easy to read. Since that was not my goal here other than letting the reader know that violence was happening, I hit upon the idea of playing with panel borders and layouts. 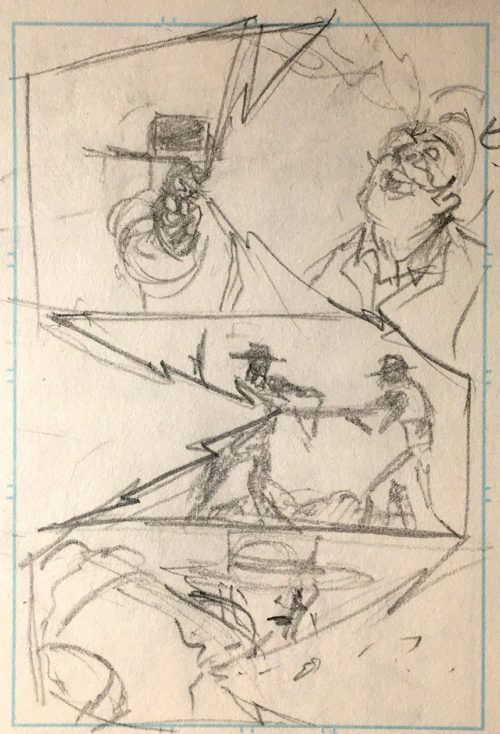 Comics are already a quickly read medium, but I wanted to emphasize the frenetic chaos of a gunfight, so smashing together what could be, at most, three panels into two or, technically, one was a fun task and, in the end, these are some of my favorite pages I’ve ever drawn. Only very slight changes from this original layout. This page was a proof of concept for me. I delayed drawing it for a long time because it scared me. Once I found this layout and penciled and inked it, it surprised me how well it worked.